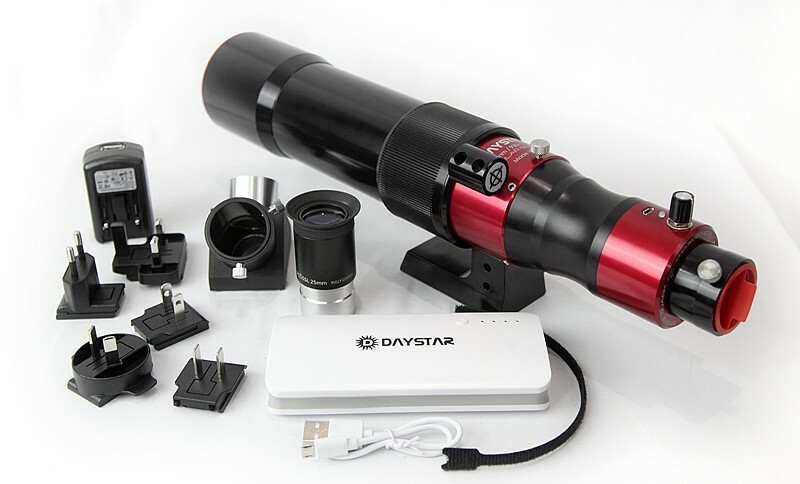 The DayStar Solar Scout is a dedicated Hydrogen Alpha solar telescope, with an aperture of 60mm. SS60-ds "Doublestack" version, with accessory bundle. The engineers at Daystar have made great strides in cost reduction so that we can now offer a quality 60mm H alpha telescope at unheard-of pricing! Batch 4 is IN STOCK FOR SAME-DAY SHIPPING TODAY! 10,000 mAh Daystar battery with mounting strap. ** Application of 2" eyepieces or components, and Camera T-adapters require additional, optional accessories.